Aquascape Analysis #8: J. Reece's "Iwagumi Rock Garden"
This Aquascape Analysis is for Jordan Reece's beautiful "Iwagumi Rock Garden," which was also the tank of the month at Aquatic Plant Central. The tank is an ADA 90P and it's a perfect example of Japanese style (Amano inspired) aquascaping. First, the profile is a pleasing "V" shape with two uneven peaks on either side. This creates a natural valley in the middle, carpeted nicely with Hemianthus callitrichoides. The two rocks help create the height, aided by some taller stem plants. 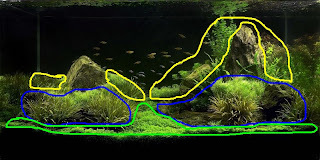 They also act to separate the aquascape into three distinct areas: the left, the middle, and the right. This is aesthetically pleasing to the viewer. The focal point is clearly the rock on the right side of the aquarium. The bight green plants around it help to create a draw for the viewer's eyes, contrasting with the darkness of the rock itself. There is a secondary focal point on the left side of the tank around the other rock, which draws the viewer's eyes because it juts up into the background. Both rocks form the basis for the flow present in the aquascape. Since they are mostly vertical, the viewer's gaze naturally flows down the rock from the focal point and towards the opposite focal point, crossing the middle of the tank. The foreground, which wraps around the front of the aquarium, is separated from the background by the Blyxa japonica. The contrast in textures between these two plants makes the area where they meet and overlap very interesting and pleasing. The taller plants behind the rocks help to create a deeper sense of depth to the aquascape, enhancing visual interest. Overall, this aquascape could very well have come straight out of the ADA gallery. Congratulations to Jordan for creating such a beautiful and mesmerizing aquascape! Love your analysis! Can't wait for the next one! Wow.. awesome analysis. 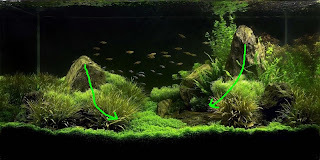 Definitely eye-opening and inspiring for us newbie planted tank aquarists! Wonderful analysis... keep up the good effort! Great post. Do you mind me using some of this information for my own blog? You've got some pretty handy articles!